One of fashion's first families, Missoni, have landed a new frontman for their latest campaign — and surprisingly someone who normally stays behind the scenes. Spanish directory Pedro Almodóvar, most recently lauded for his twisted drama, The Skin I Live In, makes his modeling debut (at least, we think it's his debut) in Missoni's newest ad campaign. 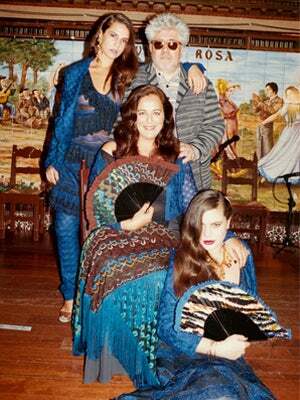 While we'll admit that Almodóvar may not be the most obvious choice of model, we think he makes a sweet addition to some of the Missoni family albums as he poses alongside Angela and her daughters. Flexing his (somewhat) natural posing prowess, Almodóvar helps represent the strong Spanish influence infused in the spring '12 line. Other, more-seasoned models in the Missoni ads include Mariacarla Boscono, and actresses Rossy de Palma and Blanca Suarez, all shot in Villa Roma, a Madrid destination we'd certainly like hit up for their tapas and flamenco scene (as per Angela's suggestion).